Lily is the reason that Gluten Free Garage exists. Here she is with her fave gluten-free cupcakes from Almond Butterfly Bake Shop. Ever since the early days of Gluten Free Garage, my daughter Lily has been asking to be a guest speaker. Since Gluten Free Garage is essentially a big party for Lily—and, by extension, other people with celiac disease and those with gluten intolerance—it only makes sense that the guest of honour gets to speak. 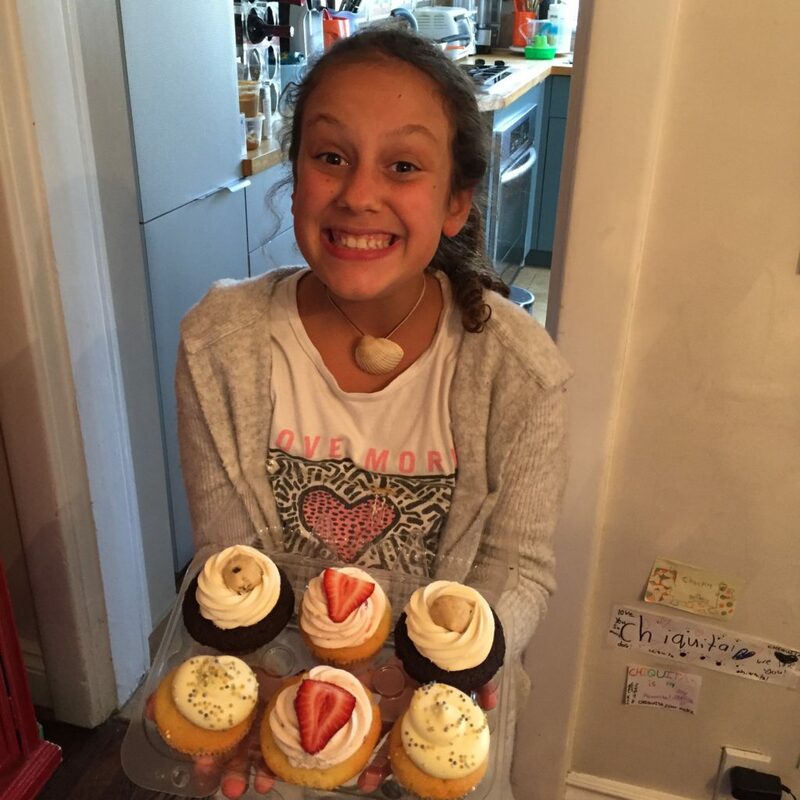 Now, eight years after she was diagnosed with celiac disease, at 11 years old, Lily is going to take the stage at Gluten Free Garage and share the top 10 things she has learned from having celiac disease. Come for the talk and stay for the cupcakes! After Lily does her top 10, gluten-free Almond Butterfly Bake Shop will join her to host a Cupcake Decorating Extravaganza! Bring your children to decorate gluten-free and dairy-free chocolate and vanilla cupcakes with colourful frosting, organic all-natural sprinkles, organic gummy bears, dairy-free chocolate chips, cookie crumbs, brownie bites, and more! Almond Butterfly does not use any artificial colours or sweeteners in any of its baking. The kids are sure to enjoy this yummy hands-on speaker session! followed by a Cupcake Decorating Extravaganza with Almond Butterfly Bake Shop. Posted in Bakeries we ❤, Celiac disease, GFG speaker!, GFG updates, Happiness is..., Lily's corner, Tummy love.